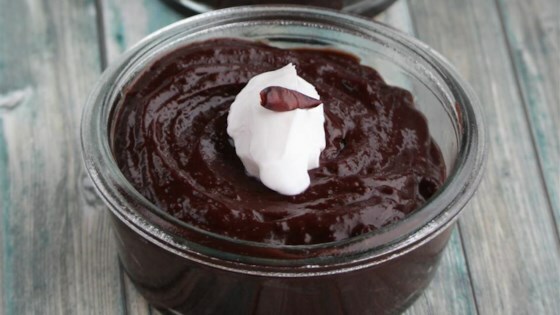 "This is a super easy pudding that can be adapted as needed to be both vegetarian or vegan. It is low-fat and a responsible snack for those watching their diet but seeking a sweet chocolate dessert. A very versatile pudding recipe that is easy to modify. Can be eaten warm, if preferred." Mix sugar, cocoa powder, cornstarch, and salt together in a saucepan; whisk in 1/4 cup almond milk until foamy and smooth. Continue adding almond milk, 1/4 cup at a time, to cocoa mixture until mixture is smooth and foamy each time. Place saucepan over medium-high heat and cook, stirring constantly, until mixture comes to a simmer and starts to thicken, about 5 minutes. Remove saucepan from heat and stir in butter until melted and smooth. Add vanilla extract and mix well. Pour pudding into serving bowl and refrigerate until chilled, at least 30 minutes. If desired, you can garnish with chocolate sandwich cookies, chocolate chips (great when served warm), vanilla wafers, or graham crackers. I like lining a casserole dish with chocolate wafer cookies or chocolate grahams and filling with pudding - banana pudding style! Bananas are also great with this if you want to make a chocolate banana pudding. One to two tablespoons of instant coffee granules can be added to dry mix to convert to a chocolate mocha pudding (you may wish to increase the sugar slightly)! Add 1/2 shot of rum in place of vanilla, if preferred. Can be made with any type of milk (dairy, non-dairy, soy, fat free, or any flavor almond milk)! Great! I used coconut sugar . Tasted fabulous. Creamy and took care of my chocolate and sweets craving. Will do this again and again . Super recipe. Super-duper easy. Instead of vanilla, I added cayenne pepper powder. I did not add the butter. It thickens quite quickly, so keep your eye on it. Thank you for the recipe.